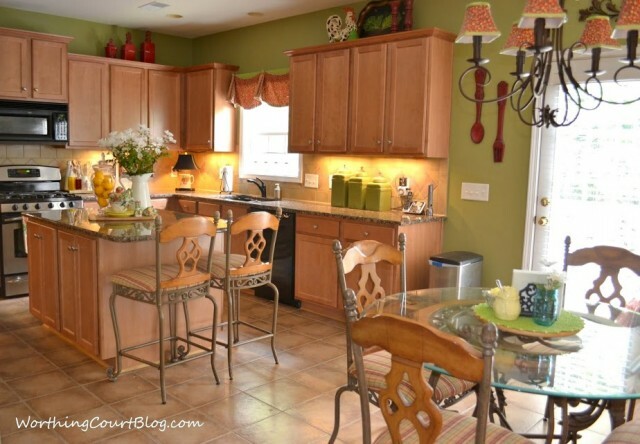 UPDATE: Enjoy this project plan for the kitchen in our former home. We’ve moved and are giving our new-to-us home a complete remodel. I’ve completely changed my style! Click HERE to take a look. The picture below is pretty much how my kitchen looks today and how it has looked since we moved into this house in 2007. It’s a sea of brown with a little bit of green thrown in. Yawn. 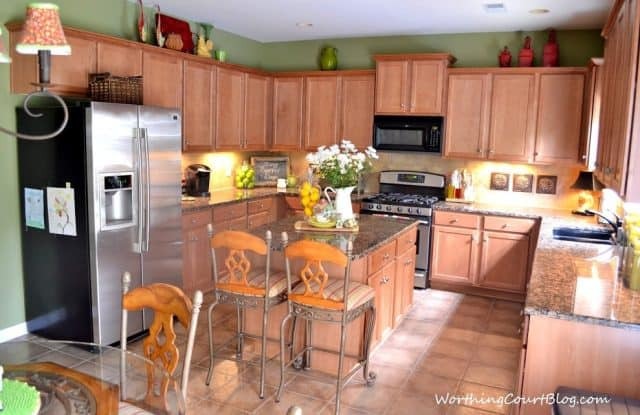 The size and layout of the kitchen are wonderful, but the finishes that the builder installed? Not so much. I’m going to give my kitchen a farmhouse style facelift and I’m going to do it on a budget. No – I won’t be painting the cabinets, replacing the granite or anything drastic like that. We plan to downsize in the not too distant future and I’m just not going to sink that kind of money into this house. I put together a little mood board to show you the direction that I’m heading in. I’ve already ordered this puppy and cannot wait until it arrives! I’ll be changing up my existing kitchen chairs and stools to make them fit in with the new table style. I’m looking forward to sharing this little journey with you. I love your inspiration board. Your kitchen is going to be wonderful and I can wait to see it evolve! Thanks Penny. I’m really excited about it! I agree, Donnamae – there’s just something about black. Can’t quite put my finger on exactly what it is though. Maybe it helps to ground a space. Ok, give us your sources as you go along. The table??????????????????????? Since I can’t change my kitchen, I will enjoy watching your kitchen take shape. Thanks for bringing me along! Hi Nan. I’m doing this facelift on a really tight budget. That’s why I’m keeping my existing chairs and stools and only replacing the table. 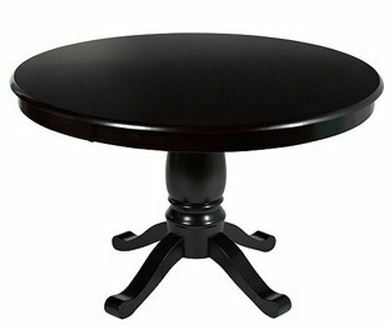 The table actually came from Walmart.com – here’s the link in case you’re interested: http://www.walmart.com/ip/Windsor-Pedestal-Dining-Table-Black/28861000. I’ve already returned a 42″ table that I ordered from them (too small), but the 48″ one is on its way! Had to pin your mood board to refer to myself later! Loved it! Thank you, Courtenay. I just hope everything will turn out the way that I want it to! Ooh, I love the direction you’re going in your kitchen. I can’t wait to see the transformation. And I’ll be on the lookout for some round stools for you. I find the quite often at yard sales (and be sure to check Craigslist, too.) I can usually pick them up for $5 or so. That’s awesome, Amy! Thank you. Oh how exciting! Both of us doing our kitchens at the same time! I love you inspiration board, especially the black and white with all the texture! Can’t wait to see it unfold!!! Yes, but I’m not getting a major overhaul like you are! I love a makeover and can’t wait to see this one! Love your inspiration board! I look forward to watching it all come together. It’s going to be amazing, I know! How did you put your inspiration board together (what app did you use?) I want to do one for my bedroom. Thanks! Marty – I used PicMonkey to make the moodboard. Let me know if you need any details! WOW, Suzy I can’t wait to see the changes. I love the table and the rest of your board. Good luck and I am sure this will be perfect. Hi Suzy-As you know I love your kitchen just as it is because it is so similar to my new one. I wonder if you could share how you put together your focal point on the island. I need some help in this area. I currently have an island but struggle to put things together. Any help would be appreciated. Hi Noreen. I assume you’re talking about the vignette in the middle of the island? If so, check out this blog post where you can see a closeup of it. 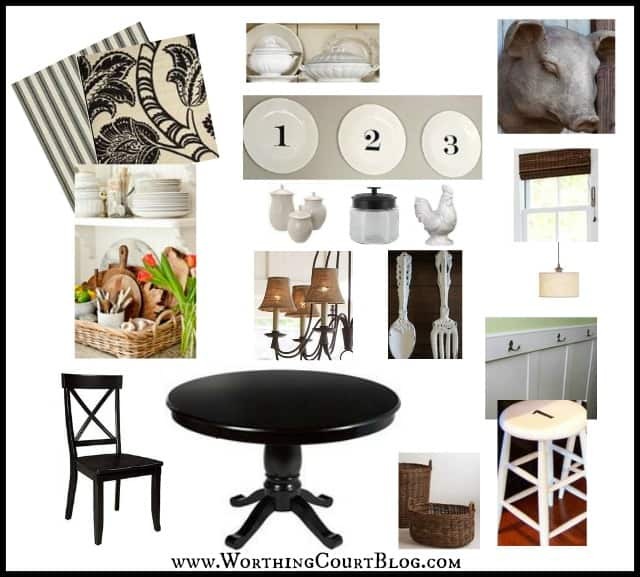 https://www.worthingcourtblog.com/2013/06/a-summer-vignette-in-kitchen.html And if you’ll do a search under “Kitchen” you’ll see lots of different vignettes that I’ve put together on the island for different seasons and holidays. Let me know if this isn’t what you’re looking for! Suzy, black and white, you are talking my language, love your mood board and all of your selections!! Can’t wait to see it unfold. I am doing a kitchen re-do too!! How exciting. Looking forward to the journey of change. I love your mood board! Great picks! Your Valentines Day table is beautiful. I love your Grandmothers glasses. You must be very proud to have those! I have a question for you. Where do you get all your white ironstone/pottery? Hi Jane. Glad you like the direction I’m heading in for my kitchen! I find the white pieces all over the place, but will only grab them if I think they’re a good price. The container in the middle of my Valentine’s table came from Garden Ridge, My dishes are Mikasa Italian Countryside. Just the other day I came across several white platters at TJ Maxx that I’m going to hang on the wall. Other places that I shop the most frequently are HomeGoods (my fave! ), Target and Marshall’s. Have a great day! I’ll chat with you soon! I would LOVE a new kitchen nook table but I am having a hard time letting go of the one we have had for 34 years… We have fed all our children at this table lots of fond memories.. I even considered painting but the top is a veneer and I don’t know how to take it off without damaging it !